Between 6th and 8th June 2016, four people, Mohamed Sidiiq Dhame, Mohamoud Ahmed, Nuradin Ibrahim and Mohamed Duale, were arrested after they expressed their opinion on an agreement signed by Somaliland government with United Arab Emirates based company, DP World, to manage Berbera port. The four people including Mohamed Sidiiq Dhame, Waddani opposition party youth wing spokesman, remain in custody at Hargeisa Central Police Station. They were arrested after they participated in a press conference held at Kaah Hotel in Hargeisa on 5th June where they criticized the agreement. According to the sources of Human Rights Centre, the arrests took place without court warrant in contrary to article 25(2) of Somaliland constitution. They are accused of Instigation to “disobey the laws”, according to their lawyer and other sources. If convicted they could face up to seven years of imprisonment. The constitution of Somaliland guarantees freedom of expression as enshrined in article 32(1) of the constitution. Article 19 of the Universal Declaration of Human Rights and article 19 of the International Covenant on Civil and Political Rights guarantee “right to freedom of opinion and expression”. 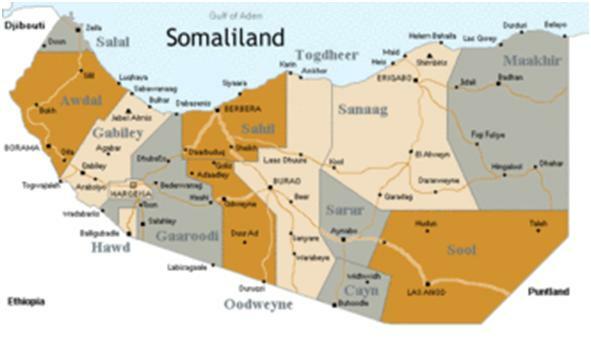 As provided in article 10(2) of the constitution, Somaliland shall act in conformity with the international law and shall respect the Universal Declaration of Human Rights. “We are very concerned on the intolerance of critics. The citizens have the right to express their opinions even in contrary to the position of the government,” says Guleid Ahmed Jama, the chairperson of Human Rights Centre. Human Rights Centre requests the government of Somaliland toimmediately and unconditionally release all of the four detainees, and to drop the charges.